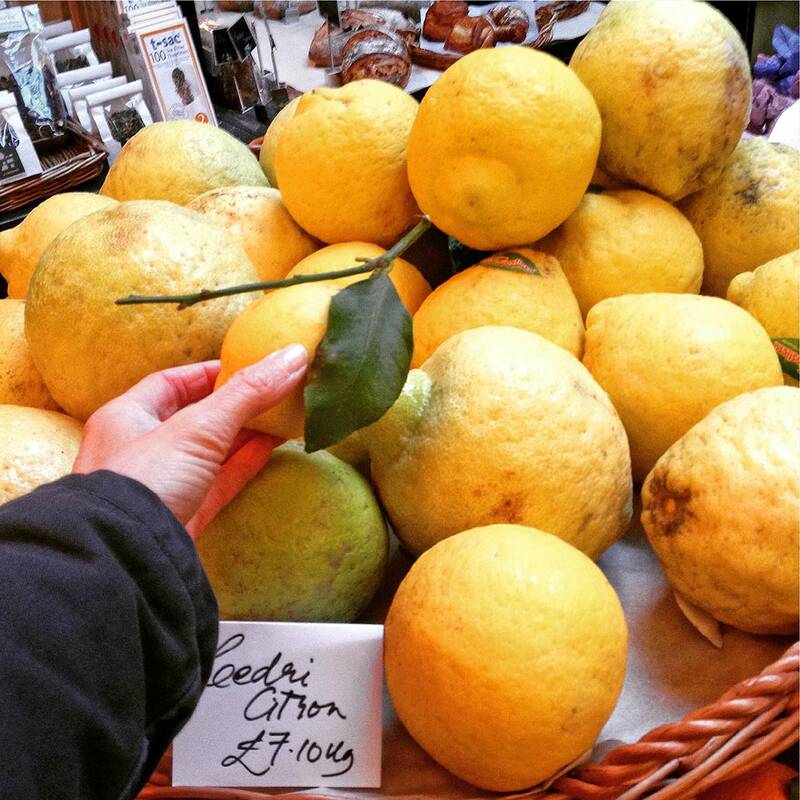 When shopping in La Fromagerie in London yesterday, I discovered a basket full of giant Cedro lemons. It is rare to see these fabulous fruit sold in London, but if you stumble across them, be sure to buy one – you’re in for a treat. The Cedro lemon (or Citron as they are called in English) is actually one of the four original varieties of citrus fruits – along with pummelo, mandarine and papeda (from which yuzu and kaffir fruits derive). Despite being one of the original Citrus species, it is now rarely found and its place has been supplanted by juicier hybrid varieties such as the common lemon we find in supermarkets year round. As you can see from the picture, the Cedri are about three times larger than a good sized ‘normal’ lemon. They appear to be overgrown and slightly misshapen, like mutant fruit. The cross section shows pale segments imbedded in a very thick, soft white pith. There is a noticeably small proportion of fruit to pith and when squeezed, it yields less juice than a lemon just half its size. Although the juice is sweeter than most lemons, the real point of these fruit is the pith and the zest. The Cedri are about three times larger than a good sized ‘normal’ lemon. They appear to be overgrown and slightly misshapen, like mutant fruit. The spongy, thick soft white pith is delicious eaten raw or cooked. In Iran it is used to make jam; in Pakistan it is made into pickles and the Southern Indians use it for preserves. Koreans make into tea as a remedy for hangovers, coughs and indigestion and in Italy, the pith is thinly shaved and eaten raw in salads or used as a topping for bruschetta. Since the Renaissance, the oils from the skin have also been used in perfumery and cosmetics due to their delicate and fragrant scent. This is a good time of year to eat a warming, comforting risotto, and by using it in this dish it doesn’t waste a single part of the lemon (they’re not cheap so you don’t want to be throwing anything away). I used fennel and celery, softened in butter and oil to make the base and sweet vermouth to balance any bitterness from the zest. Finished with the juice (which is sweeter than usual lemons and adds a good lift) and scattered with crisp sage leaves – bright, simple and luxurious. A perfect, cheerful dish for winter. Ask your local greengrocer if they can source Cedro lemons for you, or visit La Fromagerie in Marylebone or order online from Natoora. Cut the lemon in half across the middle and place it cut side down on the chopping board. Using a sharp knife, carefully slice the zest from the pith into long strips. Finely chop the zest and set aside. Repeat with the other half. Then cut thin slices of the pith and cut into long slithers. Squeeze the remaining lemon to extract as much juice as you can, removing any pips. 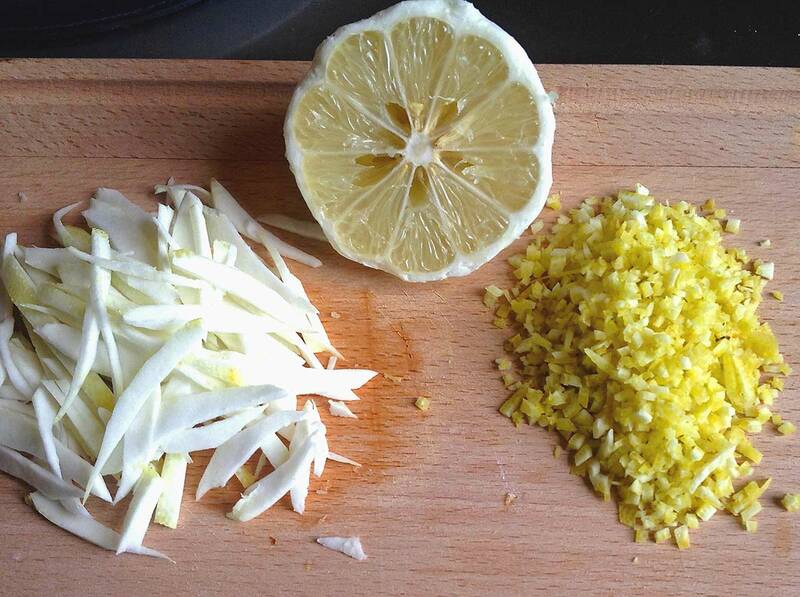 Reserve the chopped zest, slices of pith and juice to add to risotto later. Put a heavy bottomed pan on an medium heat and add the butter and olive oil. When the butter is melted, add the fennel and celery and a good pinch of salt and gently fry for at least 5 minutes until it is soft and sweet. Add the risotto rice and continue to fry for a few minutes, stirring occasionally. Add the Vermouth and give it a good stir, then allow it to cook and reduce until much of the liquid has been absorbed. Pour a ladle of stock over the rice and stir well. Continue to cook the rice, adding more stock as it is absorbed and stirring often but not constantly. After about 5 minutes of cooking, add the zest and pith of the cedro lemon to allow the flavours to permeate the rice as it cooks. Keep tasting to check the seasoning, adding salt and pepper as necessary, and the consistency of the rice. When the rice is al dente (this should take about 20minutes), remove the risotto from the heat and add the lemon juice and a little more stock (or water) so that the consistency is juicy and wet. Stir in the rest of the butter and let the risotto sit for a couple of minutes while you fry the sage leaves. Heat a little olive oil in a frying pan until it is very hot and throw in the sage leaves. Fry for a few seconds, turning them over once, so they are firm and crisp. Remove and drain on kitchen towel. 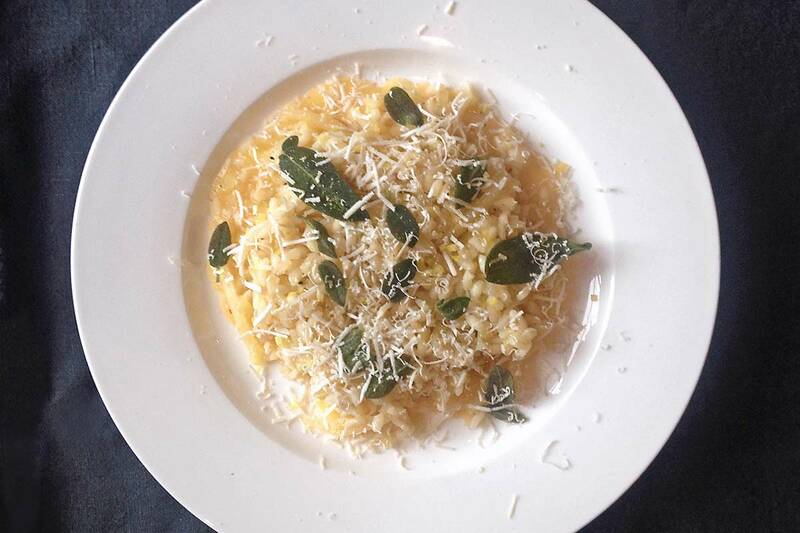 Serve the risotto on warm plates with the sage leaves scattered on top and some freshly grated parmesan or salted ricotta.